I'm just getting into Forex trading and have already spent a ton of money on books, a ton of time on forums and a ton of effort doing demo trading. I stumbled across Forex Tester and decided to give it a try. I'm very pleased that I did. With it I have been able to do hours and hours of demo trading. Because I can control the speed of the simulation, I can do more demo trading with it than I can with a real demo account (an account that is constrained to real market speed). And I can practice on weekends when the market is closed. I've already been able to test more than 5 systems and I've learned all kinds of techniques using it - finding support and resistance, drawing trend lines, practicing Fibo retracements and extensions. It has all the studies I could ask for - moving averages, stochastics, MACD, bands, RSI, etc. The interface is very similar to MetaTrader 4 which is the software I first began using to demo trade, so it was very easy for me to learn. With a few good books, a solid connection to a good training community via a good Forex forum and Forex Tester software, I have everything I need to move toward success in my trading. I'm already seeing improvements in my ability to pick good trades, avoid simple newbie mistakes and I'm seeing my simulated account growing already. Best money I've spent on my Forex education. I can't recommend this software highly enough. Excellent program!! I have to say that this is a great tool. Even though I've only been demoing the trial version I'm glad I found it. So far I haven't found anything similar that didn't require high monthly fees just to get in the door and try or so overly complex that you feel you need to be a programmer just to take your first step! This allows someone, in a painless manner, to train and test out their theories and strategies without being chained all night to the London session or so tired and beat up afterwards that the New York session feels like nine rounds with a boxer breathing in your face! We received questions from a Spanish reader regarding some features in the Forex Tester Review so we took the liberty to having Forex Tester answer the questions and then we translated for our English readers. The DailyForex Team decided to share this relevant information with our English readers on this Forex Tester Review and hope they are a great asset to your future trading. Q: I use the MT4 platform with a currency broker ACM Advance Currency Market(Swiss), I live in Argentina. I see that the basic service uses data from Forexite then downloading the data can be different with respect to the broker I use? Because if so you can get to be a difference in the analysis of strategies. A: Actually this depends on your strategy. If your strategy is long-term then you do not need precise data but if your strategy is short-term then I’d recommend using our Standard data source, if your strategy is scalping then I’d recommend using VIP data service. Q: Does the software have a wide range of indicators and oscillators? A: Yes, we have many indicators. Q: Can I test manual and automated strategies? A: Yes, you can test manual and automated strategies, note that automated strategies should be written in Forex Tester format. Q: Can I download the MT4 platform data to update the information? Q: Once the strategy is tested, can I import it into the MT4 platform I use? 1) You can test Manual trading strategies in a fast and easy way. With Forex Tester you can trade on historical data like you trade on your MT4 terminal in real time. This is very important even if you plan to develop automatic trading system, for example you may have an idea and want to test this idea before you spend time on implementing it in code. 4) In MT you cannot test your strategy on real tick data with floating spread, in FT you can. 5) You can test combined strategies (Manual + Automatic) in FT. For example you enter trades manually and exit automatically. 7) You can pause testing and analyze market situation. Or you can even “rewind” the time and “play” some moment once again. 10) When you develop your EA with the help of FT API you can use the debugger, this is very important for programmers and this speeds up the development. Actually MetaTrader was designed as trading terminal and it works good as a trading terminal, but if you want to perform back-testing and get reliable results then you need to have something more powerful than built-in strategy tester. 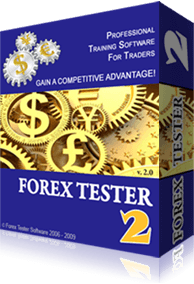 Forex Tester was designed from the very beginning to provide the most realistic testing like in real trading. It was designed for multi-currency and multi-expert testing with care about every aspect like spreads and swaps. With the best data quality. You can do manual testing, automatic testing, and both manual and automatic at the same time (there is no difference for Forex Tester). And you can visually control your testing results. We hope that these answers provide you with the necessary information you need when reading our Forex Tester Review.